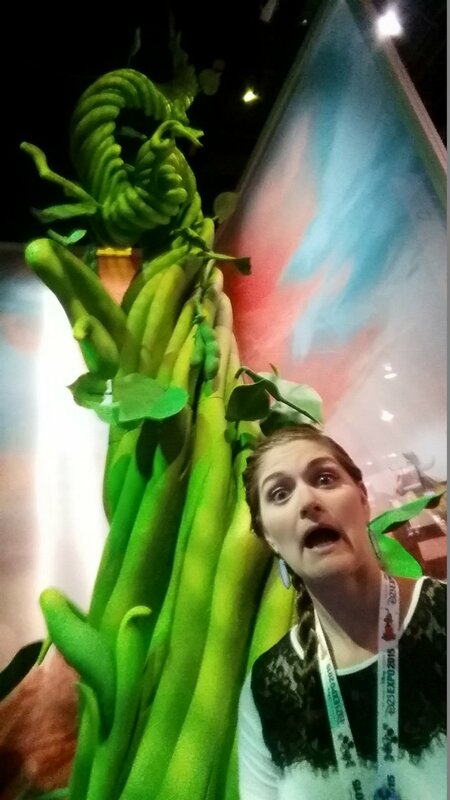 I think I am finally ready to write about D23 Expo. It was fun, but it was also frustrating. I have seen quite a few other people write about their experience and it seems the same for them too. First day for us was Thursday, a preview day for sorcerer guests. For those of you who dont know the sorcerer package was a “premium” package for people to basically be guaranteed a seat at all events, a preview day, first in line for shopping, first to the expo floor, a lounge during the expo, and other perks (but those were the main ones). Ill detail this year vs last year at the end. Thursday we walked the expo floor, picked up our pre-purchased merchandise, heard about the “game plan” for the weekend, made sure our schedule was in order and enjoyed refreshments. That night was a fireworks viewing party with light refreshments. I didnt go to this because I did it last year and I wanted to see World of Color, but Joe went and said it was ok.
Friday is when the real fun started…. 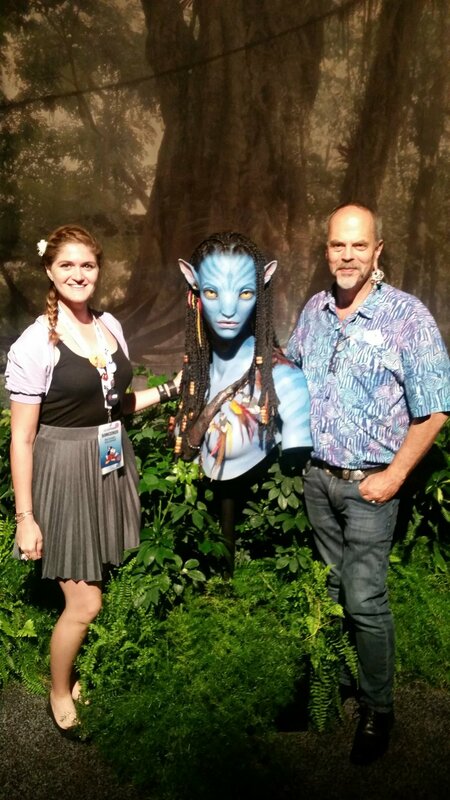 We met legendary Imagineer Joe who helped design Aulani and is currently working on Pandora, the new addition to Animal Kingdom. 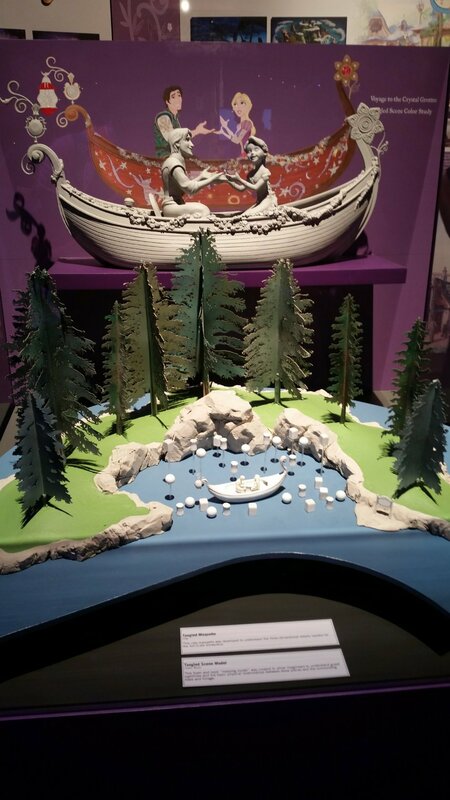 We saw the “preview center” for Shanghai Disneyland and now I want to go to Shanghai thank you very much. 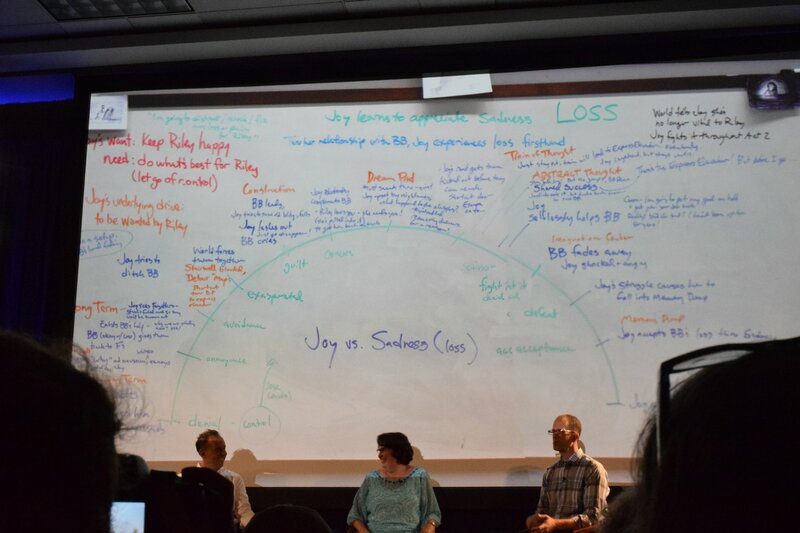 The best panel of the day was the Inside Out Panel where they discussed the process of making the movie and how it evolved into what was presented in theaters. Very cool. 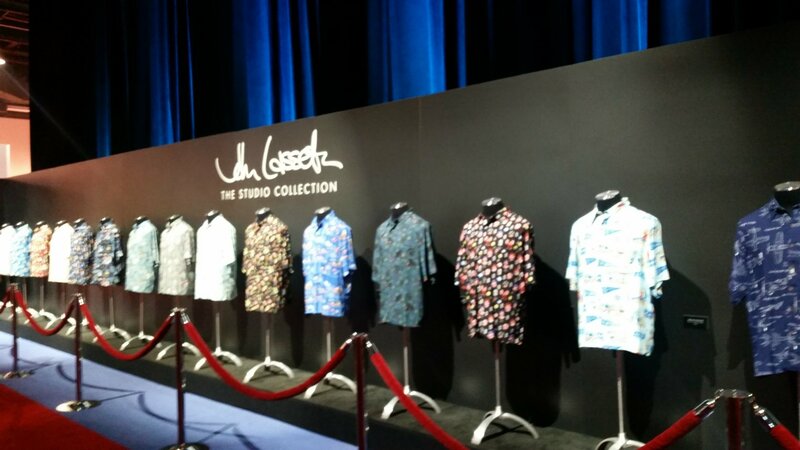 John Lasseter shirt collection, really cool. 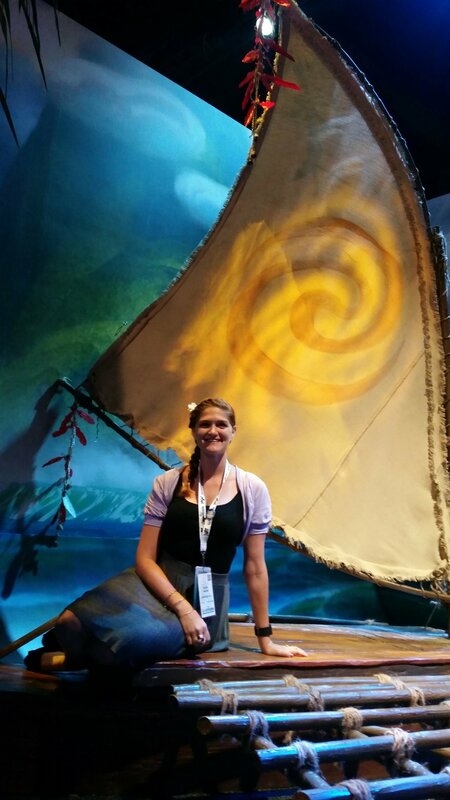 Set prop for Moana the new Pacific Island movie which looks like its going to be a refreshing new movie. 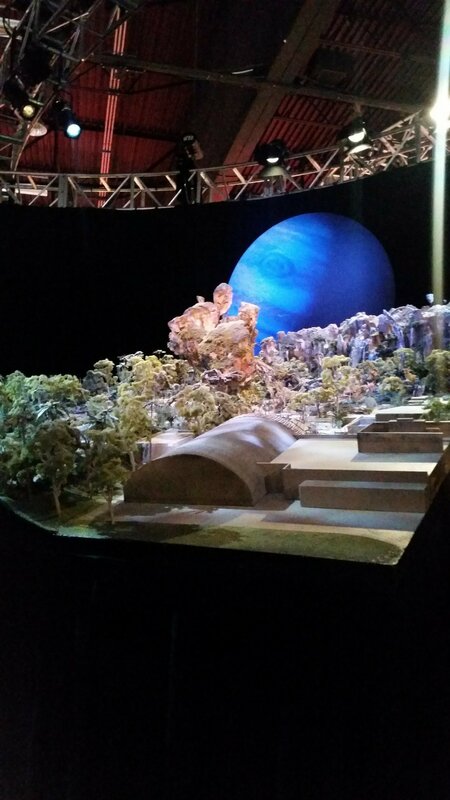 Preview of Pandora which will be light up at night with what looks like black light effects but its called something way cooler than that I just cant remember what it is. 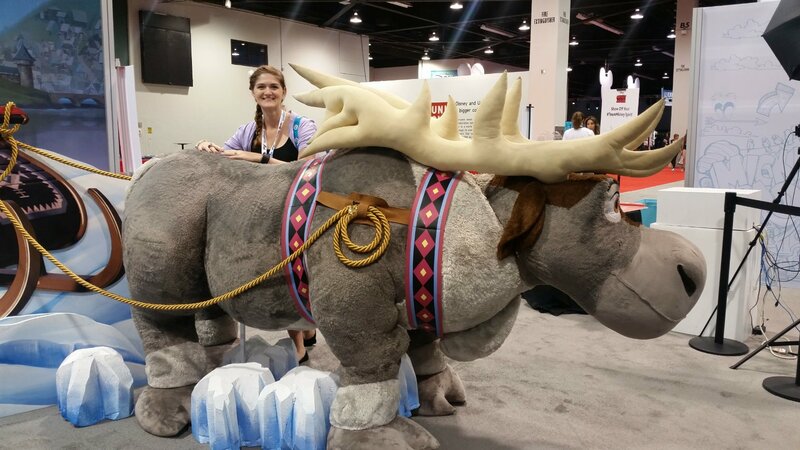 Pizza planet truck and giant Sven!! 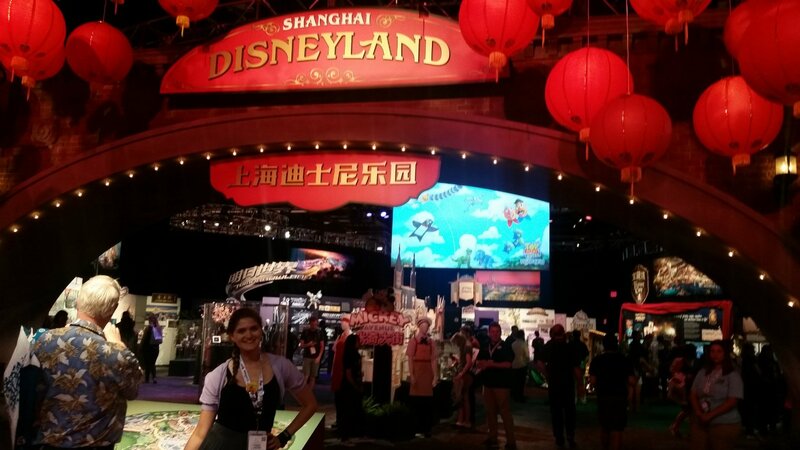 Outside the Shanghai Disneyland preview center, Pixar animation booth and a Wreck It Ralph display with working arcade games! 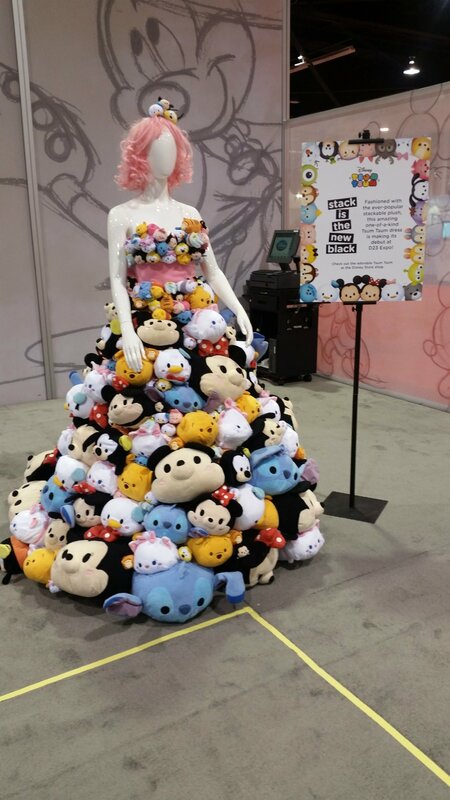 You guys people are obsessed with Tsum Tsums, example A this crazy dress. Certain times through the expo a girl would walk around wearing this. Crazy right!? 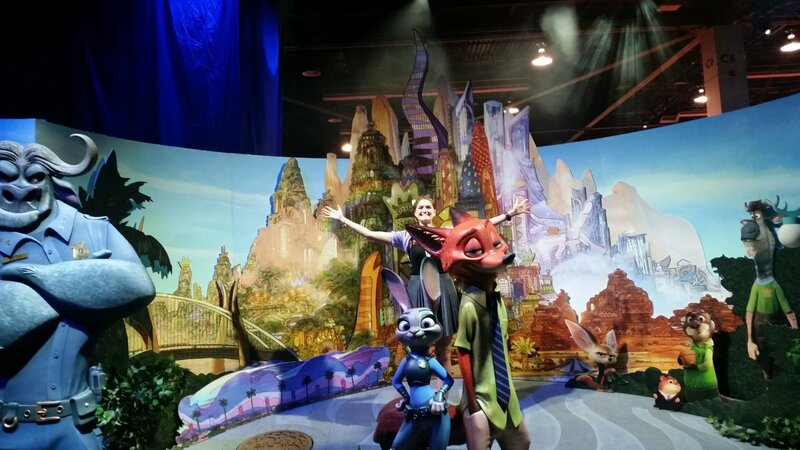 I also visited the set of Zootopia!! 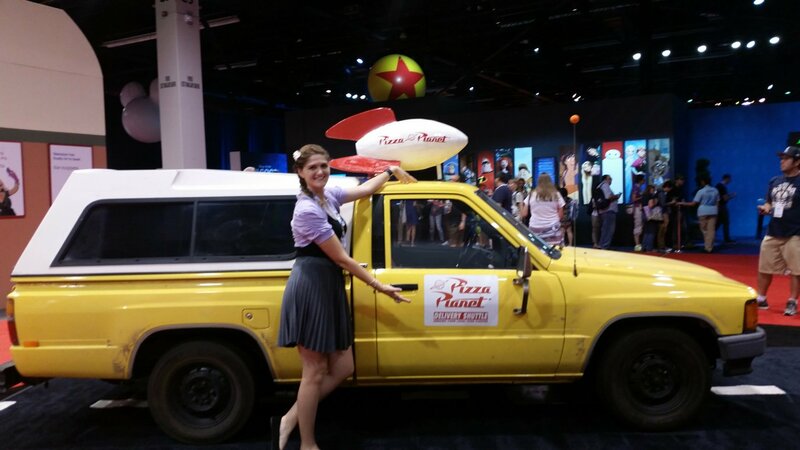 Disney Animation/live action “booth and the inside details of the pizza planet truck. 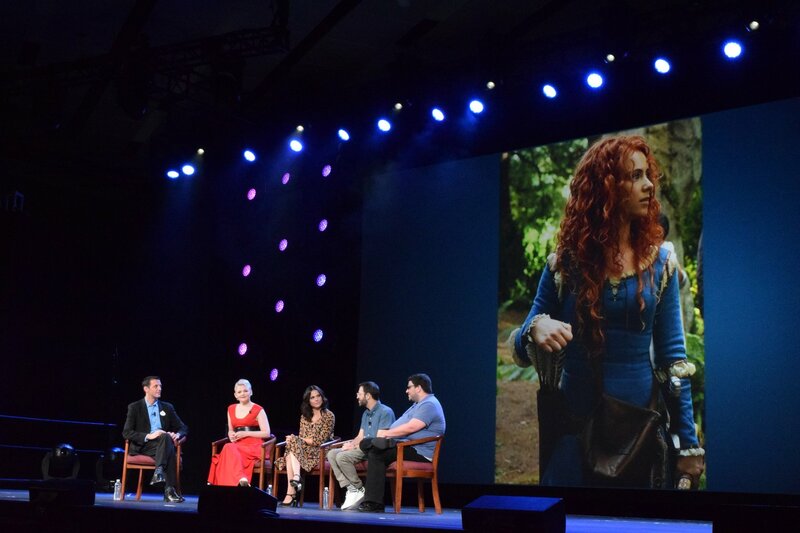 We also had the Disney Animation panel which featured movies we already knew about but got some interesting sneak peaks into Moana. Zootopia is going to be fantastic, Finding Dory should be good, Toy Story 4 is going to be directed by John Lasseter himself, Good Dinosaur is NOTHING like what last D23 showed which I cant figure out is a good thing or a bad thing, Gigantic which is the Disney take on Jack and the bean stalk (really, do we really need another jack and the beanstalk movie) and Coco a movie about Dia de los Muertos (promising). Stars we saw included Ginnifer Goodwin, Ellen, Dwayne Johnson, Ed O’Neil, Ty Burrell and a few others that I wasnt really familiar with. 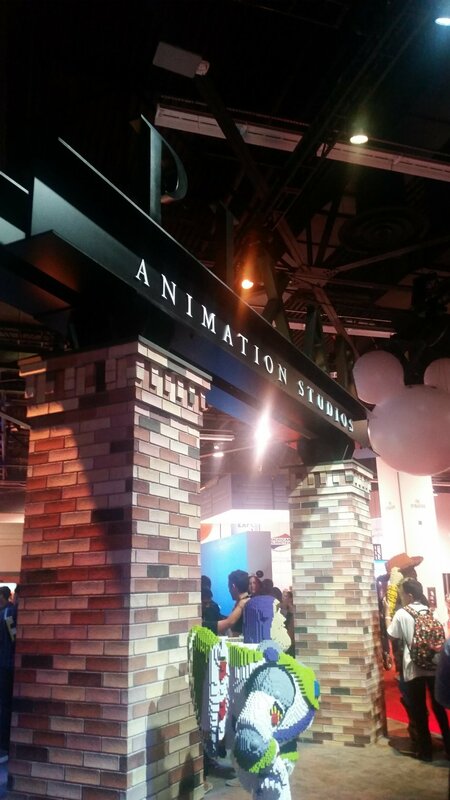 All in all friday was a slower day with the only big panel being the animation panel. We had a few smaller ones but none really stick out (other than the Inside Out panel). Friday before the panel we did the most exploring of the expo floor all in all was a good day. 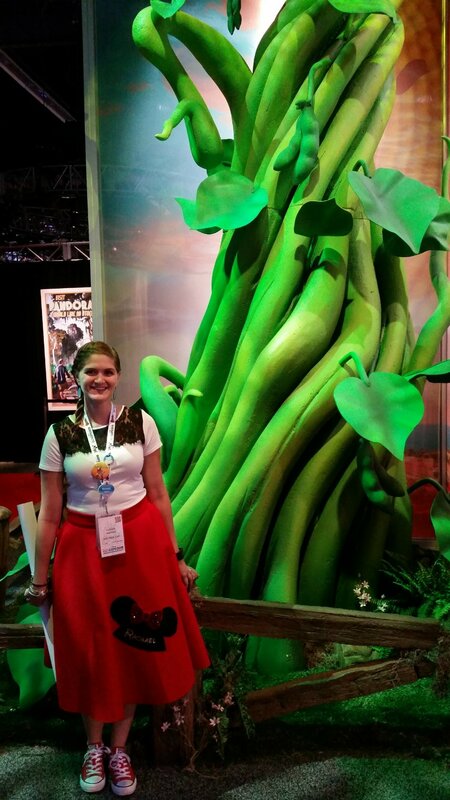 Also, can you tell you I was DisneyBounding as this day? Saturday was so crazy packed I dont know how we did it all. 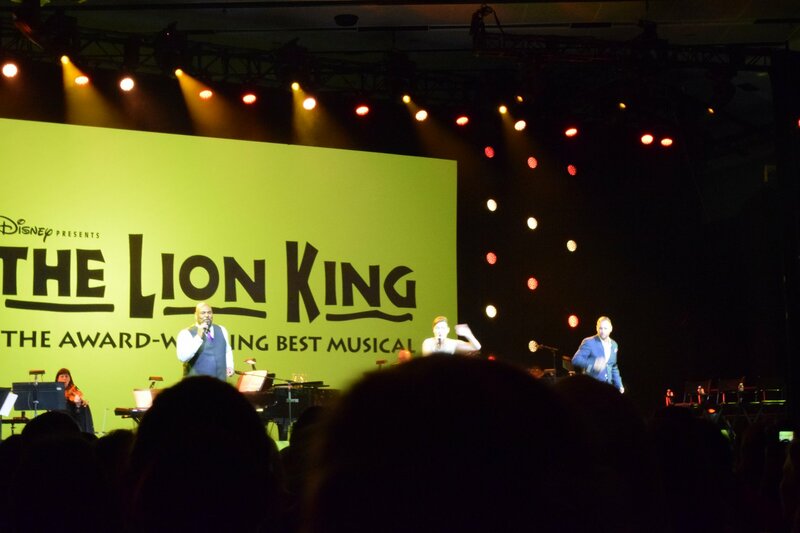 Broadway Originals, featuring Ashley Brown (Mary Poppins), Josh Strickland (Tarzan), and James Monroe Inglehart (Genie). Ive seen shows similar to this before and loved all of them. These are true performers and really know how to capture the audience. I saw the second showing of this and for the last number Josh actually messed up the beginning of “Let it Go”. I bet he was mortified but I really loved it. Not because he messed up but because it was a human moment that can happen to anyone and is just so relate-able. He recovered wonderfully and made me love him even more! 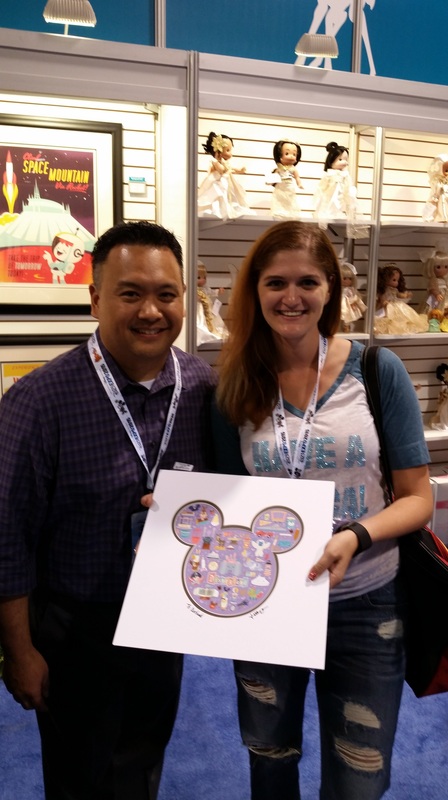 Also…Marvel photo-op! 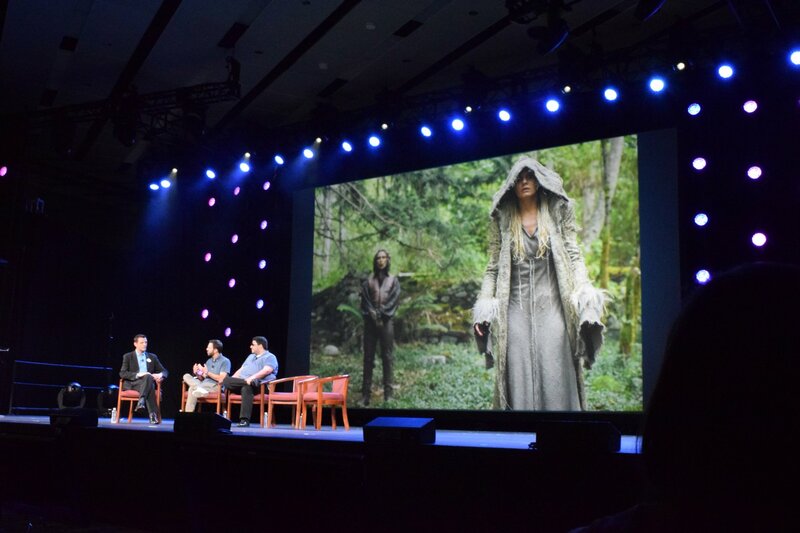 The “Once Upon A Time” panel was great. I really hate interviews with the show creators because they never give any information. Why come to an interview if you arent going to answer questions. I get not wanting to spoil any details but with these guys its at the point of being ridiculous. Luckily Ginnifer Goodwin and Lara Parilla (Snow White and Evil Queen) saved the day and surprise appearance by Josh Dallas (Prince Charming) totally saved the panel. They were charming and perfect. 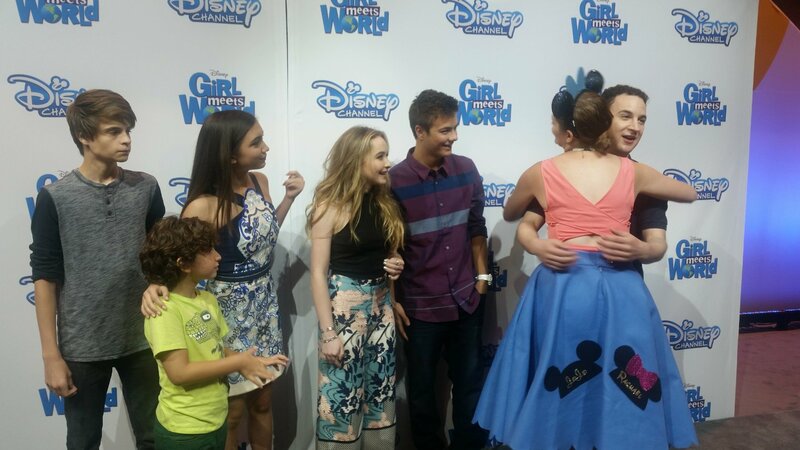 Meeting the cast of Girl Meets World totally made my day, no seriously it was awesome! Such a sweet group of people. 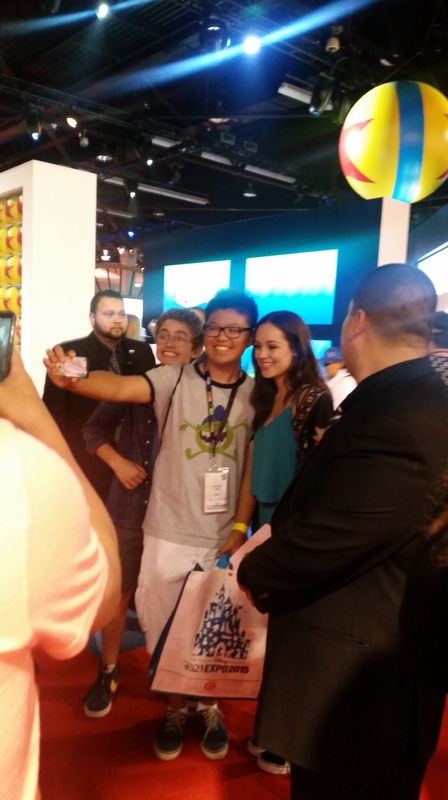 Meeting Ginnifer and Lara in person and having both of them love my skirt (Lara’s face in this picture is awesome!) was unexpectedly amazing and now I dont want to sell the doll I didnt want Joe to buy in the first place…dont ask…long story lol. Saturday was also the Live Action panel and the parks panel. 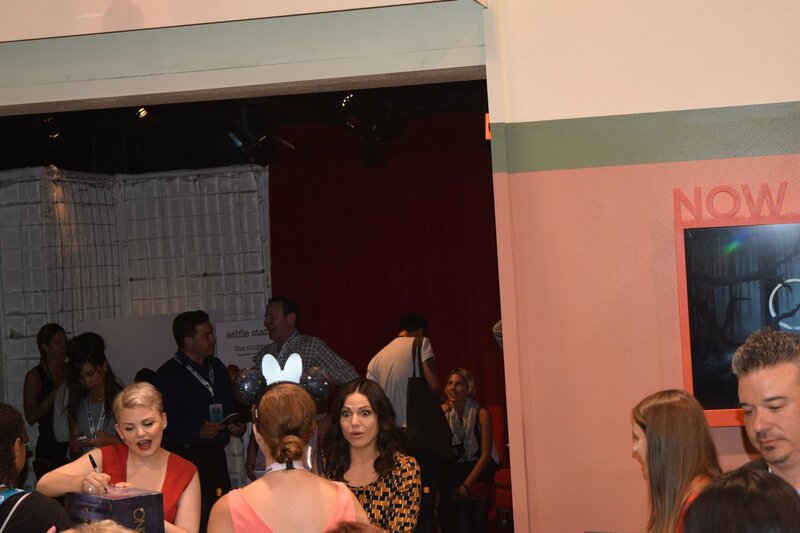 we actually skipped the parks panel because I decided I wanted to see the Broadway Originals show and try and meet them (which the line was full and I didnt get to but ended up meeting OUAT cast so it all worked out). 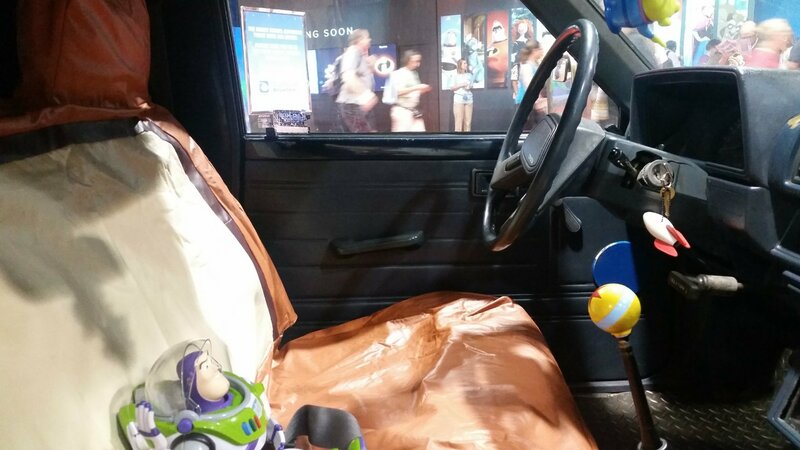 The Live Action panel was a little un-inspired. Movies they showed were ones we already knew about but did get to see trailers not yet seen. Captain America (looks epic), Doctor Strange (Benedict Cumberbatch!!! ), Jungle Book (surprisingly emotional), Pete’s Dragon (why), Alice Through the Looking Glass (meh), Pirates of the Caribbean (yes please), Beauty and the Beast (its a musical and its going to be awesome). Marvel showed their timeline (already all over the internet) and StarWars showed their timeline (again, already all over the internet). The real news was the announcement of Star Wars land coming to both sides of the country. This is really going to be something special with a fully-immersive experience. I cant wait to go and experience this myself. Celebrities we saw were Chris Evans, Chris Pine, Ben Kinsgley, Lupita Nyong’o, Harrison Ford, Johnny Depp (in full Captain Jack Sparrow costume! ), Anthony Mackie, and a few others that I dont really know. Wow, Saturday right! Such a busy day! Now Sunday, by far the most chill day. 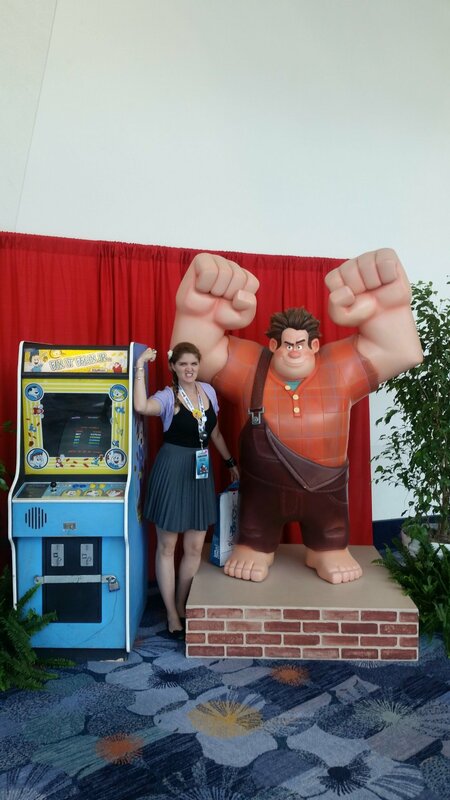 After the animation panel, this Gigantic photo-op came to life, kinda cool. Plus celebrity signthings!! The Goldberg kids, totally awesome. 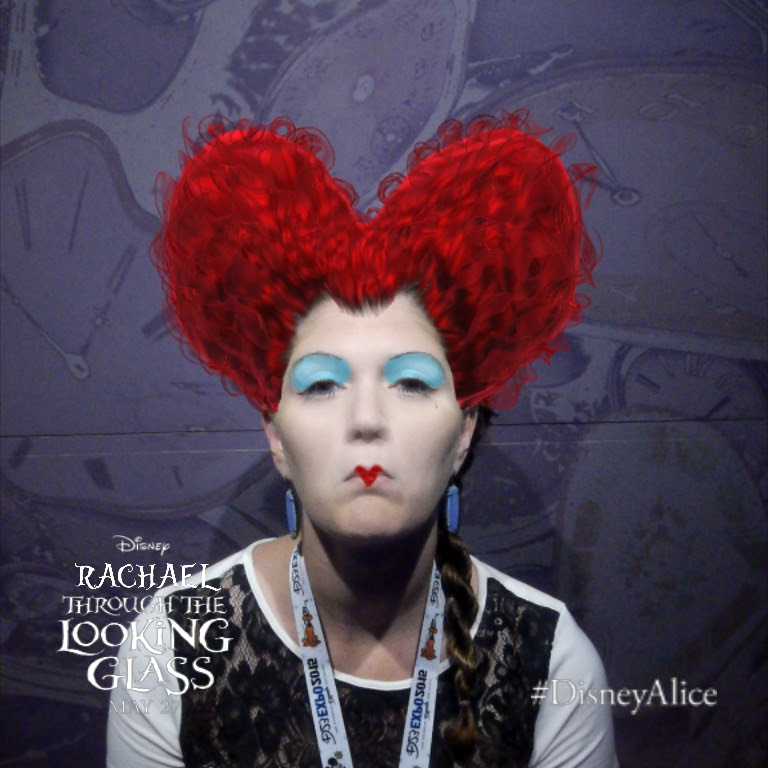 Alice Through the Looking Glass had this awesome photbooh-esk thing where you could make yourself into characters from the movie and then make a movie (which I cant upload here for some reason) and a still. A really cool concept, executed really well. We didnt have anything big on tap for today, some small panels and walking the expo floor. Joe went to the interactive panel (for games) but I didnt have any interest in this and went to smaller panels like Disney Merchandise, Disney beyond the parks, Destination D23 and a few others. Sundays tend to be the lame day and disney really needs to get it together on this. So much you cant do it all on Saturday, then nothing really interesting on Sunday. Silly. 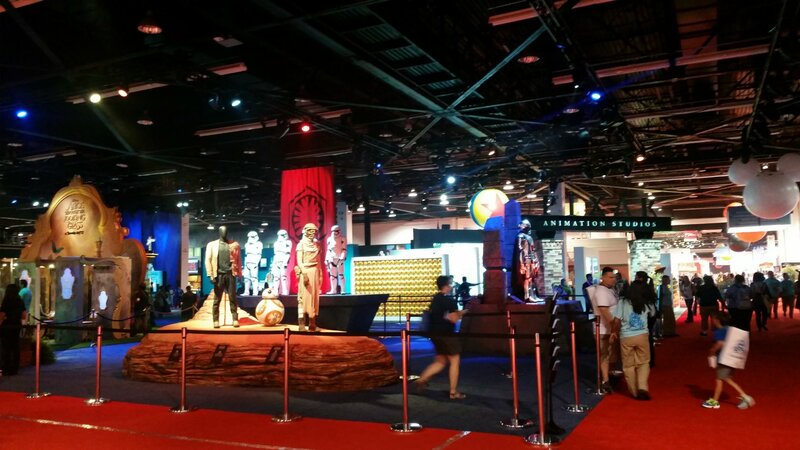 All in all, the expo floor this year was much better than years past. Some booths had some really interesting give-aways and set ups. The presentations were lack-luster and really were missing the insider, never had even a whisper of it kind of news. I was really disappointed since the reason I go to these is to get the scoop! There were way too many people, lines mismanaged, communication breakdown on all levels. You would think after 4 expos they would have this down but apparently not. As far as the sorcerer package goes…totally not worth the price of admission. Promised a Samsonite carry on luggage piece, received an american tourist tote bag. Swag in the bag was lame and almost all of it was from Teen Beach Movie 2. No other swag was given as in previous years. Refreshments were popcorn and pretzels, where as previous years but much better quality of snack. There was a silent auction for sorcerer guests only but Ethan Allen (no joke) outbid and stalked almost all auction items so no one else could bid or win. Every aspect of the package was disappointing and left me wondering what my money went towards. At the end of the day I dont think we will go back in 2017, I just dont feel the quality delivered matched the price of admission quite literally. This will be my 3rd expo and am sad to say it was a let down. I had fun with the people I was with but I can do that outside the expo. I think next convention will be San Diego Comic Con, I want to see what all the fuss is about! CHIME IN!!! Do you like Expo’s/Conventions? What is your favorite?